Each year, in collaboration with the Virginia Department of Game & Inland Fisheries, the Center for Conservation Biology performs various management activities on behalf of the peregrine falcon breeding population in Virginia. The single objective of these activities is to increase the reproductive output of the population. Shawn Padgett and Bart Paxton repair a peregrine nest tower after a storm. Photo by Libby Mojica. Since a majority of the known breeding pairs in Virginia occur on artificial structures it is important to ensure that this network of structures remains viable. Each year a considerable amount of time is spent repairing or replacing nest boxes and inspecting towers. Predator guards are installed on each tower to protect eggs and nestlings from raccoon. Snooper truck team from VDOT facilitates access to a peregrine nest beneath a bridge over the Rappahannock River, VA. Photo by Bart Paxton. Rolf Gubler, NPS Biologist, placing a peregrine falcon chick in the hack box. Photo by National Park Service. Although every effort is made to provide a stable nest structure for known pairs, some bridge-nesting peregrines continue to have low fledging rates. Observations indicate that losses occur during initial flight attempts or when chicks are preparing to fly. Nest sites high over rivers are not very forgiving and numerous chicks have been lost to the water. Other chicks have been blown from nest structures by high winds only to be found in the roadway below. In order to improve survivorship for chicks from historically high-risk sites, some chicks have been translocated to other locations where risks are much lower. These moves have involved both fostering to other broods when the situation allows or hacking to mountain sites. 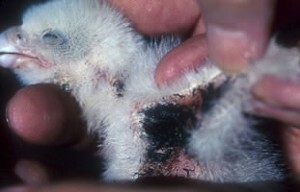 Peregrine Falcon chick with an infestation of Hippoboscid parasites. Photo by Bryan Watts. Over the years, several young chicks have been observed in Virginia that were infested with external parasites. Some of these chicks did not survive. Whenever possible broods are examined for the presence of parasites and treated with agents to increase the likelihood of survival.